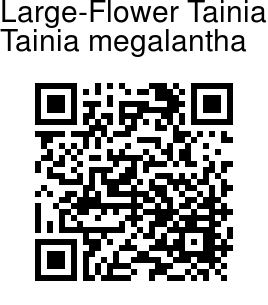 Large-Flower Tainia is a medium to large sized, hot growing terrestrial orchid with erect, cylindric pseudobulbs carrying a single, heart-shaped leaf. Leaf is tapering at tip, 5-7 veined, entire margined, mottled to marbled. The plant blooms in the spring on an erect, hairless, 12.5-18 cm long, 4-10 flowered inflorescence with 2 basal bracts and spreading, triangular-lanceshaped floral bracts. Flowers are showy, blackish green with purple veined sepals and petals, white lip with purple streaks , yellow tinge on column. 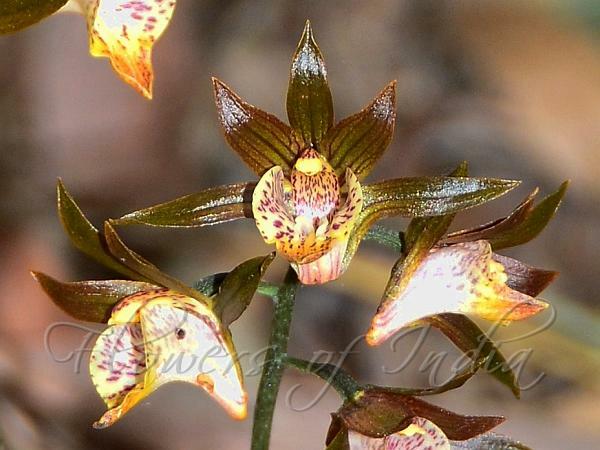 Petals are slightly shorter but broaderthan sepals. Lip is about 2 cm long, defled from middle,folded at end margins to give 3-lobedappearance, 3-keeled on disc. Column has a long foot. Large-Flower Tainia is found in the eastern Himalayas in tropical valleys at elevations around 300 m.
Identification credit: Pankaj Kumar Photographed in Tamdil, Mizoram.